I feel like this is a conversation that I’ve been having for most of my adult life. For someone who came of age in the 90s and early 2000s, it can be hard to explain to other people why feminism is still necessary. Many of our bigger, more obvious goals – voting rights for women, the ability to own land, equal education for girls, and more control over our own reproductive systems – have, in the western world, largely been achieved. The landscape of third-wave feminism, which began in the early 90s and continues today, is often confusing and tricky to navigate. Some third-wavers question whether “feminism”, a term that might be limiting and can seem as if it’s promoting oppressive gender roles, should even be used. On top of that, it often feels like the current incarnation of the feminist movement has devolved into petty bickering about whether or not mothers should stay at home, or how a “real” woman is supposed to give birth. So why even call yourself a feminist anymore? On the surface, these arguments seem to make sense. I mean, you catch more flies with honey, etc. If using different terminology means that more people are willing to work towards equality, then that must be a good thing, right? I mean, let’s be honest – the term feminist conjures up images of angry women burning their bras, or intimidating women stomping around in army boots telling men what’s what. Feminism is often equated with hating men, or with the idea that women are the superiorsex. In contemporary mythology, stereotypical feminists only make up for their lack of a sense of humour with their surfeit of untamed body hair. Here’s the thing, though: calling yourself an “equalist” slides you right back into all those traditional gender roles that society wants you to be in. Being an “equalist” ensures that you won’t intimidate anybody, that people won’t see you as someone who goes against the grain. It turns you into a smiling, apologetic woman who says things like, “but I just want everyone to have equality – men and women.” It makes you totally non-offensive, and as such, takes away a lot of your power. Women who describe themselves as equalists strike me as people who are afraid of conflict and who, above all, want to be liked; men who call themselves that strike me as people who want to deny all the challenges that women still face. When we talk about equality, in a lot of cases men are already hold the standard that women are trying to achieve. It was only last year that women working for Canada Post won the right to equal pay – and this, by the way, stemmed from a case that was filed in 1983. The New York Times recently reported that a a heavy and persistent bias against women still exists in the scientific community; most troublingly, this bias is upheld and perpetuated by just as many women as men, which goes to show you how deeply misogyny is ingrained in our culture. Women still have to be afraid when walking alone at night; hell, we have to be afraid when out at a bar with a friend, or out on a date, or in almost any situation when we encounter a man alone. We live in a culture where women have to fear for our safety in ways that I don’t think men will ever understand. And, of course, our reproductive rights are always, always in jeopardy. All of that is only the stuff that’s happening here at home – what about the challenges facing women in other parts of the world? Countries where women have to fight for the right to drive, or work outside the home, or walk around in public with their hair uncovered? Countries where terrorist organizations shoot little girls in the head just because they want to go to school? There are places where just being a woman is treated as if it’s a crime. This isn’t to say that there are no issues facing men – to the contrary, gender stereotyping certainly affects men as well as women. But when we start talking about equality for men, it often comes to dominate the conversation, derailing any attempts to discuss the ongoing inequalities faced by women. We need our own space to talk about what’s happening to women today; we need our own conversation about issues that are unique to us. We need feminism. Look, I’ll be honest: I wish we lived in a world where just talking about concepts like equality meant promoting the rights of women everywhere. I wish that we didn’t have to use labels like feminist or pro-choice; I wish that we could just trust people to be sensible human beings and look out for each other. We don’t live in that world, though. Not even close. 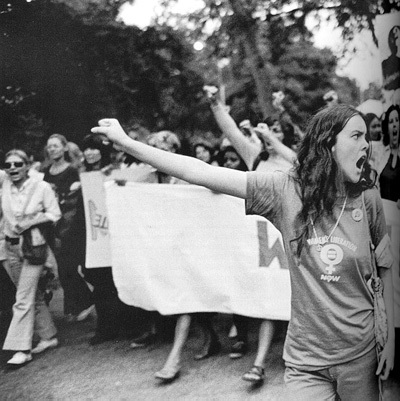 In spite of the progress we’ve seen over the last few generations, the feminist movement still has a long way to go before it achieves its goals. Maybe someday we will live in a world where half the world’s the population doesn’t have to suffer simply because they’re women – I mean, I guess anything’s possible, right? That’s what we’re fighting for, right? Until that time, though, I plan on being an intimidating, humourless (though admittedly body-hair-free) feminist.